U.S. Representative Martin B. Madden deserves more recognition than he has received. 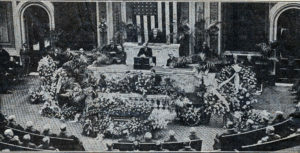 During his lifetime, Madden was a national figure of great importance. Time and Madden’s modest nature contributed in part to his lack of recognition. Dean Rodkin, Darien Historical Society, has worked to preserve and publicize Madden’s contributions. Madden’s local connection to Darien was through his marriage to Jospehine Smart, the daughter of Elisha Smart, an early and wealthy settler of Cass. and then moving to Lemont, Illinois, where his wife’s brother-in-law was living. Martin persuaded his parents to let him seek work in the Lemont stone quarries. Athens (as Lemont was referred to) limestone was in great demand to meet the growing needs of Chicago. Martin began his career earning 50¢ a day as a water boy at a quarry. In 1870, Martin was transferred to a barge line on the Illinois and Michigan Canal that carried stone to Chicago. However, a year later, he slipped while tying up a barge, and caught his foot between the barge and the canal bank. His leg was so badly mangled that it was amputated at the knee. Rather than pursue a lawsuit, Martin’s family accepted the company’s offer to employ Martin as a clerk. Thus began a career that eventually led to Martin becoming President of the Western Stone Company in 1895. In 1878, Martin visited Elisha Smart, a prosperous farmer living in Cass. So the story goes, that as he arrived at the Smart property, he heard Josephine, Elisha’s youngest daughter, singing. Martin fell in love with Josephine and they were married in 1878. A few years after their marriage, an infection damaged Josephine’s hearing. Despite the best care, nothing could be done and Josephine became deaf. Their daughter Mabel was born in 1886. 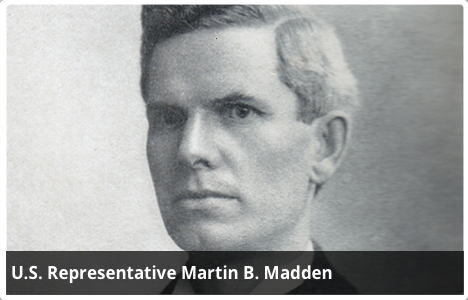 During the 1880s, Madden decided to enter politics. Martin and Josephine wher living at 3929 Michigan Avenue, Chicago, in Chicago’s 4th ward. Martin served as a member of the Chicago City Council from 1889-1897, and was its presiding officer for four of those years, including 1893, the year Chicago played host to the World’s Columbian Exposition. 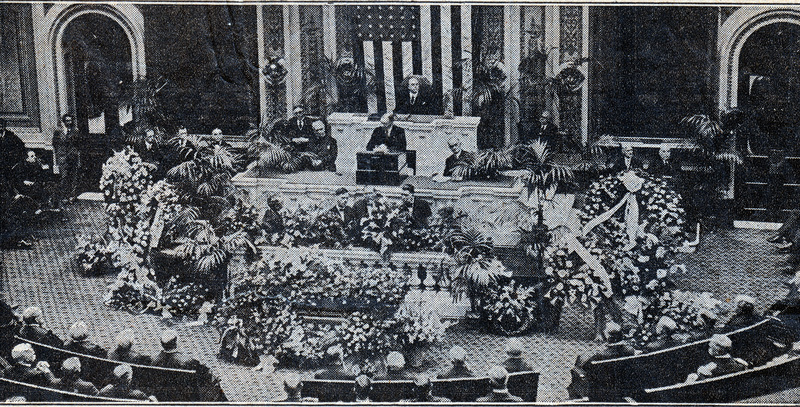 his political career was capped when he was elected to the United States House of Representatives in which he served from 1905 until his death in 1928 at the age of 73. While in Congress, he served as chairman of the Committee on Appropriations. His stature was confirmed when the fighting “watchdog of the treasury” was accorded a funeral in the House of Representatives. In 1903, on the site of Josephine Madden’s childhood home, the Maddens built a summer home, rumored to be a 25th wedding anniversary present. The home, located at Bailey Road and the I55 North Frontage Road, is today known as the Carmelite Spiritual Center, formerly called Aylesford. Martin called it Castle Eden after a place in England. Castle Eden was built to be a replica of the White House in Washington, D.C.
Josephine Madden died in 1934. Both she and Martin are buried in Cass Cemetery along the I55 North Frontage Road.